Climber Will Risk All to Reach the Top in Kingdom Come 2134! He’s here—one of the most fearless men in GWF history! CLIMBER is joining the Federation Defense Fighters in 2134. His finishers, DEADMAN ANCHOR and TWO-MAN STAND (tag) reflect the high-risk moves that he brings from his mountain-climbing background. Easy-going but confident, Climber is set to defy the odds and be a sensation in 2134! 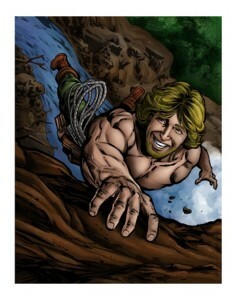 Which GWF legend trained Climber and is bringing him to the GWF? And does that mean the legend will return in 2134? Climber is part of a new GWF tag team. Who is his partner and how far can they go in their rookie years? Answers coming soon in KINGDOM COME 2134!